For so long now, I've set aside dreams because I have duties and responsibilities to answer to. I kept my frustrations in, let it eat at me until I operated like a metallic robot that moved as it was told, day in and day out. This blog became a little outlet where I could be myself, where I could talk about my feelings, share my fancies and reflect on lessons learned in life. Joining this contest that had the potential to take my little space on the internet and bring to a global level started something in me, a rekindling of the fighting spirit that I thought had died out a long time ago. At first, I competed because I felt obligated as my friends and family rallied behind me (despite only informing them halfway through), and that's when I realized that the only person holding me back was me. So today, I write this as an accountability post, to remind me of a promise to find new opportunities, to grab them as I spot them, to not let my irrational fears get the best of me, and to try, try, try. I ended up one spot away from the top 10 finalists, even though I honestly tried my hardest to catch up. I could claim to be the almost-finalist, right? 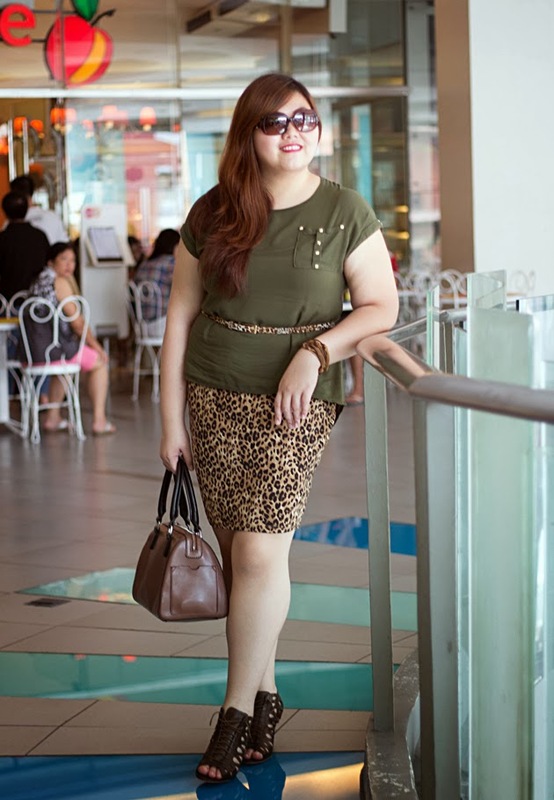 :) Joining this contest is ultimately to get an award, a recognition for the work we do as curvy bloggers. But when I shared this blog with people (who had no inkling I was running a blog) and saw how supportive and enthusiastic they were for me, I realized I had already hit my goal. So, from the bottom of my heart, THANK YOU. Thank you for sticking around, for encouraging me with your comments and your votes, and for believing in me. I wouldn't have gotten this far without you. Roar! You're a winner in my book!!! You styled this look perfectly! Gorgeous! I LOVE everything about this outfit! And congrats on getting so close to the top ten- there's lots to be proud of! I love the leopard skirt and the leopard belt! You look so pretty! 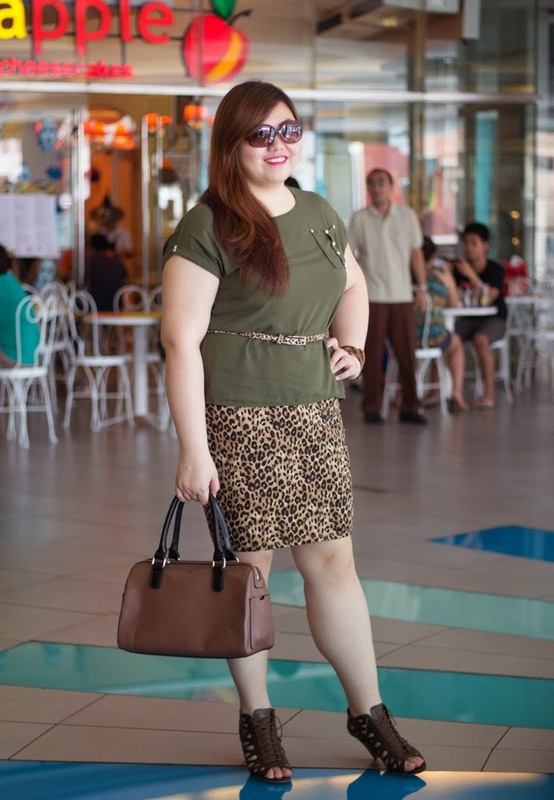 Leopard and olive green look amazing together. I am loving that skirt, its fierce. 2. You're too brave to take pictures in mall. I can't take pictures in front of anyone. I like duck behind a bush until a car passes and then go carry on when I'm SURE no one is around. It frustrates J terrible. 2. I have to. I don't post that often because I really don't have the extra time to find a vacant spot and conveniently have someone with me to force into taking my pictures. Haha! Oh my goodness. Your shoes! I'd search far and deep and wide for more lace-up booties. Abi, this is a very cool combination here with the Army Green and the animal prints. Nice cut-out peep-toe booties as well. Sweet style from a stylish lady like yourself.